The lengthy text block on the box announces "It's hard to imagine someone thought of the idea to create frozen pop sickles made from pickle juice. It is even harder to believe someone tried it and liked it." Well, that's damn true. But it isn't hard to believe that someone challenged us to try it. And by now, it shouldn't be all that hard to believe that we took them up on it. 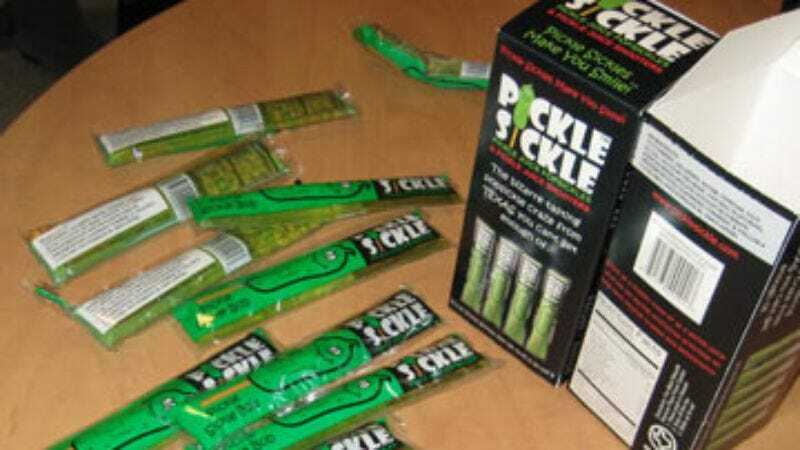 If you believe the box and the website hype, Pickle Sickles—essentially pickle brine in popsicle-like plastic tubes, suitable for eating frozen or drinking straight as a "pickle juice shooter"—are the newest taste-treat sensation in Texas, "where this wild idea is a mouth puckering favorite." Nonetheless, Pickle Sickles' marketers are pushing pickle-juice-in-a-tube as everything from a fat-free, low-cal snack for kids to "a frozen treat diabetics can eat" to "a pickle juice pick me up during strenuous activities to help with muscle cramps and dehydration." The makers also "dare you to take them to work or to school to have when you need a health snack or want to just look cool." 'Cause nothing impresses your peers like watching you drink something their moms normally throw away. Pickle Sickle also comes in jalapeño flavor, which came to us packaged in the exact same boxes and tubes as the regular flavor, only with new ingredient lists manually glued onto the exterior of the packaging. Which is a little unnerving. We would have been considerably warier of the relatively mundane Snickers Charged candy bars if they'd just been ordinary Snickers bars with a laser-printed "now with caffeine!" sticker hot-glued on the front. But then, how much warier could we possibly be of pickle juice in a tube? We all knew pretty much what it was going to taste like: pickles, in juice form. What we didn't know, because we aren't from Texas, was what it would taste like frozen. Or with jalapeño added. Or most importantly, mixed with a bunch of booze. Because when they said "shooter," we all immediately thought of alcohol, and we figured vodka would probably improve the taste—and would certainly improve the impact. Taste: If you've ever eaten a commercial dill pickle straight out of the fridge, you should know what cold bottled pickle brine tastes like, unless you've always made a point of hand-patting each pickle dry, and squeezing out all the excess fluid. Pickle Sickles taste like commercial dill-pickle juice (as opposed to the usually milder homemade kind), with the salt content cranked way, way, way up. (Surprisingly, in spite of the flavor, they have a relatively low sodium count. Plus only three calories per pop!) Meanwhile, Jalapeño Pickle Sickles taste like salty jalapeño juice: spicy, prickly, and extremely sour. And, um, salty. Then we had a Pickle Sickle popsicle party, which was more popular in that many people volunteered, but less popular in that that the overall response was "Um, gross. Salty and gross." • "It's interesting enough on first taste, but I can't imagine eating a whole one, especially not on a hot day. It's just not refreshing enough to merit the term 'popsicle.'" • "if you just lick it, it's not bad, but if you bite a piece off, it's horrible. The liquid version is actually a lot better then the frozen one. I think because the flavor lingers in your mouth less." • "This is what I imagine the ice-cream man in the South serves, and his music would be 'Freebird,' not 'Pop-Goes-the-Weasel.'" • "It tastes like pickles times a hundred. I was expecting it would be a lot less intense, more watered-down." • "I didn't say so for fear of all the ridicule, but I think I'd actually eat the jalapeño pops even if I wasn't being forced. This coming from a kid who drinks the liquid left in the jar after the pickles were gone. What do you expect?" • "Pure disgustingness. People kept saying, "Eh, it's not that bad." No, it is. The popsicle is repugnant; one lick and you've had enough." • "After one sip, it made my throat burn very, very uncomfortably." • "Yeah, it really burns. It's like a pickle salt lick." • "I'd rather eat crickets." • "I just want to note that the word sick is right there in the name." • "That tastes like you dumped a couple tablespoons of salt into a teaspoon of vodka and added a pickle taste just to make it worse. I don't know if there's enough gum in the world to get this taste out of my mouth." • "The jalapeno elements pleasantly remind me of a nice, spicy Cajun martini. But the strong notes of vinegar kind of ruin the effect." • "I think it could actually be good with a little more tweaking—not that different from an extra-dirty martini. Though I imagine it would give you some pretty heinous dragon breath." • "It just tasted like the really cheap vodka you used to steal out of your parents' liquor cabinet when you were young. Not like Tom-Petty-playing-in-the-background vodka; like Paul Newman brand vodka." • "It's surprisingly un-bad. The salt cuts the harshness of the vodka, and the vodka cuts the sharpness of the salt. Granted, now it tastes kind of like rubbing alcohol smells, but that's still better than I thought it would taste." Now, of course, we're all sitting around work drunk off our asses and with pickle-breath. (Kyle Ryan has spent the last hour wailing that he can still smell pickle, that it's everywhere, and that it just won't go away.) Personally, I can't get Arlo Guthrie's "Motorcycle Song" out of my head. ("I don't want a pickle / I just wanna ride on my motor-sickle…") But I'm pretty sure that's the vodka talking, and not the popsicles. Incidentally, the Pickle Sickle slogan is "Pickle Sickles Make You Smile!" This generally proved to be true. But it was a pretty grimace-y smile, and we were mostly grinning at the faces other people were making while hesitantly biting into frozen, cucumber-tinged, spicy salt-juice. Where to get them: Picklesickle.com, also your resource for wildly enthusiastic Pickle Sickle recommendations, health information, and a surprising number of quotes from detractors.